Luca Curci talks with Georgina Lohan during PLACES the second appointment of SURFACES FESTIVAL 2018 in Venice. Georgina Lohan is a multidisciplinary artist currently working in porcelain sculpture. 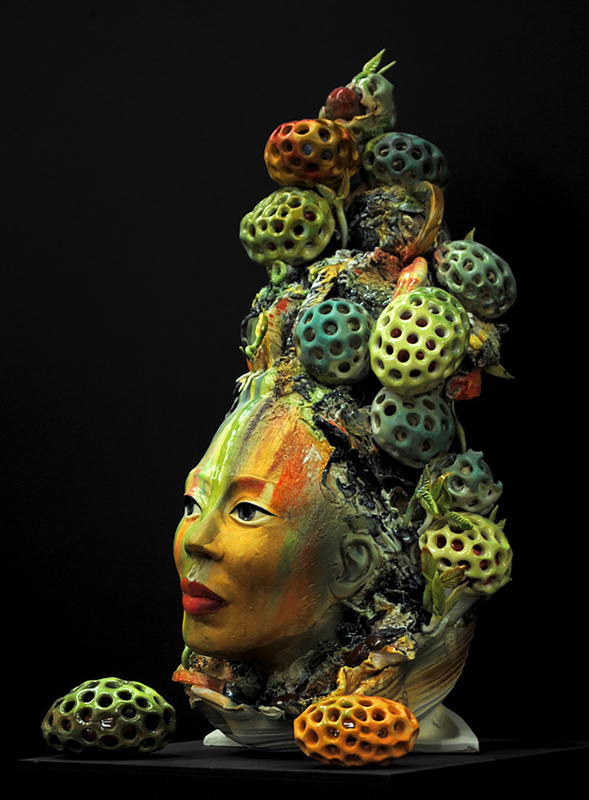 Her work has developed through extensive exploration and experimentation with materials. As well as painting in watercolour, tempera, acrylics and oil, Georgina has a background in printmaking, carving, casting, fused glass, textiles, set and costume design, jewelry design and mixed media collage. As well as exhibiting her artwork, Georgina has contributed to the development of many creative projects including her role as founding director of the Eastside Culture Crawl, an open studio tour of over 500 artist’s studios, which has helped shape the creative landscape of Vancouver, BC for the past 20 years. In 2016, Georgina was invited to travel to China with the Craft Council of BC to help establish an artist in residence program near Xiamen, Fujian Provence. 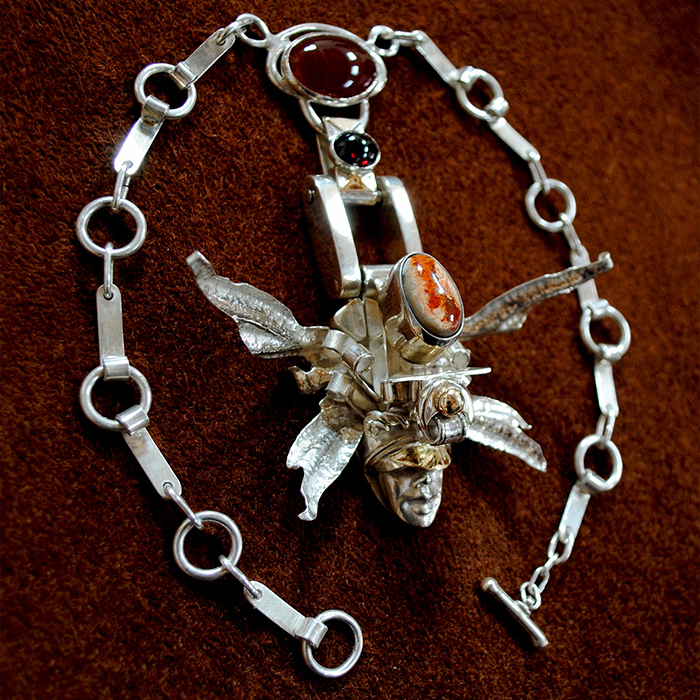 Georgina is based in Vancouver, BC, and has exhibited in Canada, Mexico, USA and Italy. Georgina Lohan – As one of six girls raised by parents of Anglo-Irish heritage, in a small town on the west coast of Canada, I was very fortunate to grow up within a family culture that valued and educated us in the arts. I was exposed to a rich variety of visual and performing arts from many different countries and eras, but it was not until college that I learned more about Abstract Expressionism, which disrupted many of my earlier ideas about art. When I left art school, integrating these diverse views became a current that helped propel me forward, along with a commitment to develop work that upheld a position of strength for women. I produced work as a painter until my early 40’s when I slowly became obsessed with clay. I set up my first clay studio in 2007 and this has been my full-time occupation for 11 years. 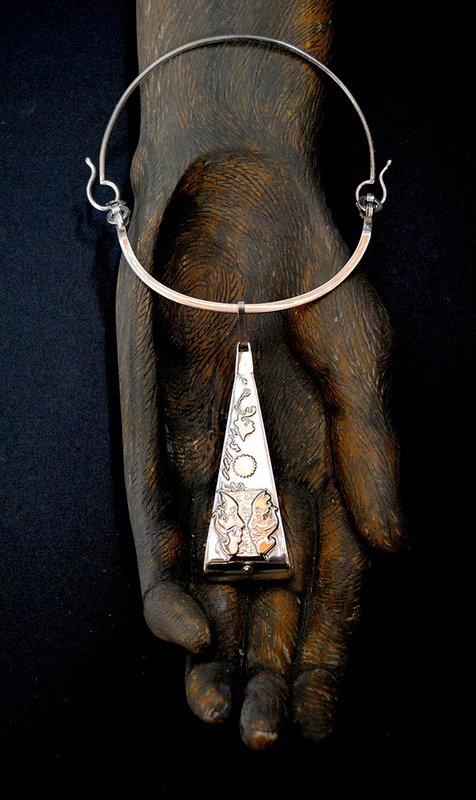 I am also a silversmith and have designed and created jewelry for over 20 years. G.L. – Currently, I am working on a series of porcelain sculptures that collapses the concept of body, building and landscape into it’s form. My intentions with this work are to convey the human drama we are experiencing today. L.C. – Where do you find your inspiration? G.L. – Inspiration is wherever you look for it, it is there, in all things. I think that is why the word is connected to breathing, it is a sign you are alive and aware! Also, the process of making things inspires one with more ideas the more one makes. I am at my most intensely creative when I am pushed to complete a new series of work and I don’t have time to do one more thing, then I get more ideas than I can possibly realize! G.L. – My creative process is a bit like a ride on a rollercoaster- slowly chugging up the hill, that’s the research part, saturating myself with images, visualizations and reading, some small scale experiments. Then I get to the tipping point, where i start to organize myself and my studio set-up for the next phase where i will have to focus exclusively on the series of tasks and the speed required to bring the project to timely completion, as I am often working to deadlines. Once I begin, I must surrender to the ride; what happens in the moment, to be on the fly, receptive and ready to improvise. The more skills I acquire, the more direct my techniques are. This opens a space of personal freedom to express the content I am preoccupied with. L.C. – Which art themes do you pursue? What is your preferred subject, if there is any? G.L. – Through the intricate processes of making porcelain sculpture, I conceptualize experience that is encapsulated in the earth. Excavating 18,000 years of ceramics history, which contains the worlds cultural heritage, informs my practice and links the Late Paleolithic with the contemporary era. This dialog between the personal and the universal connects questions of existence & equality, psychology & evolution, the fragment & totality, and helps contextualize the effects of advanced industrialization on human development. It has lead me to re-imagine the human story as a 3D collage made of porcelain clay, describing a journey of transformation. L.C. – What is the message linked to the sculptures you have shown in this exhibition? How is it connected to the theme of the entire festival? G.L. – For the PLACES exhibition, the work I participated with showed the first two porcelain sculptures of my new series, Through the Crack, which explores the the effects of the urban environment on human identity. The festival focuses on the concept of SURFACES, borders and structures between body mind and and soul, the human identity and the city, the space and the ground. These ideas connect strongly with my intentions for this new work: to collapse the concept of body, building and landscape, into columnar forms. Steel mesh, coated with clay and integrated into the porcelain sculptures, warped and melted from the high temperature firing, references a post-industrial ethos. The buildings alluded to are not the works of celebrated architects, but the shanty towns and vernacular structures created by people in response to available materials and needs. The geologic layering of textures and forms allude to Deep Time and the many natural processes that humans evolved through to become the species we are today. At the crown of each column is a single figure, reaching upward, the gestures of dancers describing a moment of intensity. Collectively, these figures form a chorus, or community of individuals. 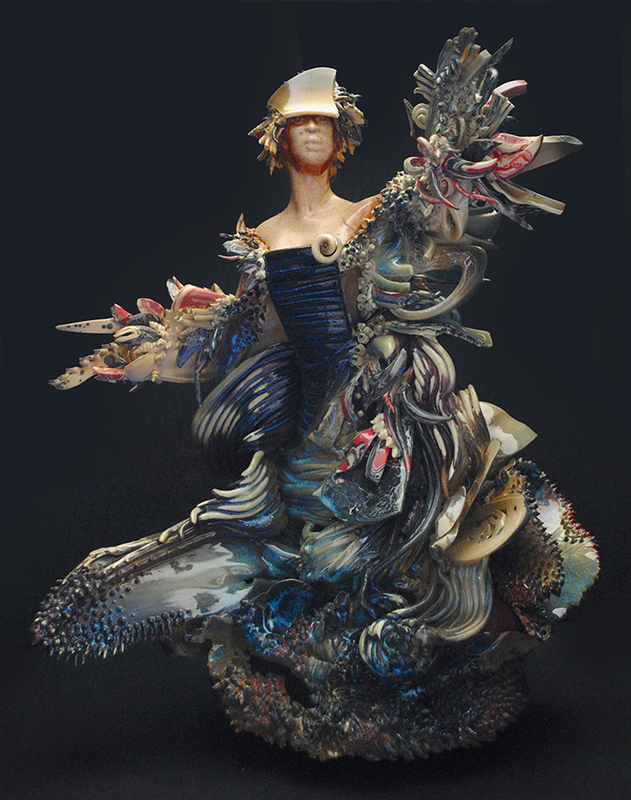 For the SPACES exhibition, I will present the porcelain sculpture, Origins, a work of speculative fiction. Traveling backward along the human timeline to a primordial past, this work explores themes of evolutionary psychology, research into species evolution and the development of human culture. Origins depicts humans as embedded in the natural world, of which they are a very small part, co-evolving with a myriad of other species. As our social complexity increased along with our numbers, and collective strategies for survival evolved into distinct cultures, we established special relationships with other species to further our survival. This work examines the mythologies of emergent cultures and questions how this may have affected our belief systems, habitat development and social hierarchy. I believe how we frame the past will influence how we move into the future. L.C. – Do you agree with our vision of art and what do you think about the theme of the festival? G.L. – I connected strongly to the the theme of the festival, and was intrigued by the festivals aims to analyze the relationship between body and space, and the hybridization between identities and cultural/physical/social/urban settings in contemporary time. G.L. – ITS LIQUID GROUP offers diverse opportunities for visual artists, performance artists, designers and architects with an eclectic program of exhibitions and events, presented in an international context at venues in many different countries. L.C. – Did you enjoy cooperating with us? G.L. – ITSLIQUID GROUP has been particularly helpful in assisting me with my exhibition needs and logistics, shipping, and other services. The support I received has been very timely and much appreciated. L.C. – What is your idea about ITSLIQUID GROUP? G.L. – I think ITSLIQUID GROUP fulfills a need for both emergent and more established artists, designers, and architects, to enter into a dialog regarding themes and ideas relevant to the contemporary context. I see this as a way to help us all create something of value, which is hope for the future!